On January 14, 2013, Ambassador Benno Bättig, General Secretariat of the Swiss Federal Department of Foreign Affairs (FDFA), received at his office in Berne, Switzerland, the Hawaiian Kingdom’s Instrument of Accession to the 1949 Fourth Geneva Convention for the Protection of Civilian Persons in Time of War. 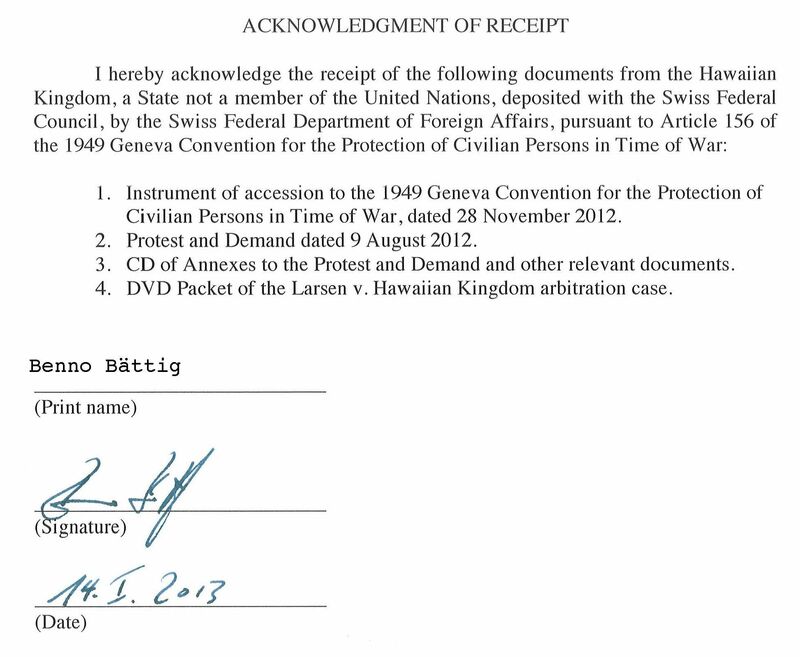 Along with the Instrument of Accession, Ambassador Bättig also received a copy of the Hawaiian Protest and Demand deposited with the President of the United Nations General Assembly, August 10, 2012; and a DVD package of the Larsen v. Hawaiian Kingdom arbitration case at the Permanent Court of Arbitration, The Hague, Netherlands, 2001. The FDFA is responsible for maintaining the foreign relations of Switzerland and serves as the Swiss Ministry of Foreign Affairs. The department is headed by Federal Councillor Didier Burkhalter. The FDFA is composed of a General Secretariat and the State Secretariat, to which the department’s directorates and agencies are subordinate. 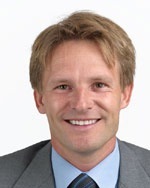 Ambassador Bättig was appointed General Secretariat January 11, 2012. CLARIFICATION: Article 156 of the Fourth Geneva Convention provides that accessions shall be notified in writing to the Swiss Federal Council and the Swiss Federal Council shall communicate the accessions to all the Powers in whose name the Convention has been signed, or whose accession has been notified. The Swiss Federal Council receives accessions through the FDFA. And according to Article 159, the Swiss Federal Council also informs the Secretary-General of the United Nations of all ratifications, accessions and denunciations received by them. Hey Foster! Whats up? Good to see you commented! Anyway, I’m so excited and yet apprehensive at the same time. I’m no expert but it all seems to be happening so fast. Are we sure we’re ready for this??? Aloha Kiele… Yes. It is exciting and humbling in deed. “Are we sure we’re ready for this?? ?” With all due respect, doubt is a distraction. Focus is on remedy…and here is a clean and civil process with integrity to achieve remedy. No drama (i.e. emotions, opinions, etc. ), just a process (rational, methodical solving of an injurious act presently left to rot and eat away at our flesh)… IMUA! Mahalo Switzerland for taking a look at our country. Plz reply re:the illegal takeover of helco/heco etc. Queen Liliokani was overthrown to protect her subjects, and her and King David knew how to bring electricity 1874, to her subjects. Plz call RJ & Sativa @missionpossibleradio@gmail.com, or 808-965-7270. Their research about Ormat Industries, owners of puna geothermal plant, extracting precious minerals from Pele’s steam is saddening, enlightening, &maddening, upsetting, all at the same time. A hui hou, malama pono…..Alohalani from Kakapana, 808-965-5399 or cell:808-896-9201. I Hope=Alohalani, request a reply asap if the last reply got thru? !